China's first lunar lander is scheduled to touch down on the moon Saturday and release a mobile rover for scientific studies, according to official Chinese media reports. The rover, named Yutu, is smaller the NASA's Mars rovers but packs a suite of cameras, rock-studying science instruments and a ground-penetrating radar to find out what's underneath the moon's charcoal-colored surface. Yutu translates as "Jade Rabbit" in English. Less than two weeks after launch, the Chang'e 3 mission dropped its orbit less than 10 miles above the moon this week, setting up for the lander's rocket-powered descent Saturday. Chinese media reported the landing is set for 1340 GMT (8:40 a.m. EST) in the Bay of Rainbows, a dark basin filled with solidified lava. If successful, the landing would be China's first visit to the surface of another solar system body. Chang'e 3 is also poised to become the first spacecraft to achieve a soft landing on the moon since the Soviet Union's Luna 24 mission arrived in August 1976. Chang'e 3's success would also make China the third country to accomplish a soft landing on the moon, after the United States and the Soviet Union. 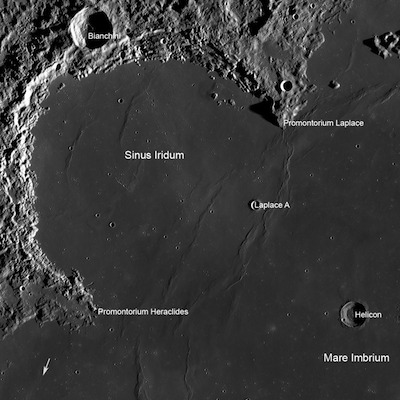 The Bay of Rainbows, also named Sinus Iridum, has never been explored from the surface. The sun rose at the landing site this week after a two-week lunar night, ensuring the Chang'e 3 probe lands in daylight and has ample sunlight to generate electrical power. The spacecraft carries plutonium packets to keep warm during future lunar nights. The powered phase of Chang'e 3's landing is expected to last about 12-and-a-half minutes, and the craft will use a variable-thrust rocket engine to adjust its approach to the landing zone. The engine will slow Chang'e 3's velocity from 1.7 kilometers per second, or 3,800 mph, before pausing the descent at an altitude of 100 meters, or 328 feet. The lander's on-board autonomous hazard detection system will ensure it does not come down on large boulders or a steep slope, according to Chinese media. About 15 feet above the moon, Chang'e 3 will switch off its landing engine and drop to the surface. Shock absorbers on the craft's four landing legs will cushion the impact. Chang'e 3 left Earth on Dec. 1 atop a Long March 3B rocket, entering a direct transfer trajectory to the moon. The trip took four-and-a-half days, and Chang'e 3 reached lunar orbit Dec. 6. The mission's rover, equipped with six wheels, cameras and science instruments, could disconnect from the lander shortly after landing, going down a deployable ramp to the drive onto the moon, according to reports. 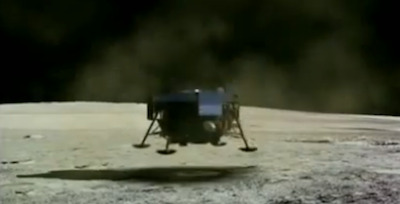 The 140-kilogram, or 308-pound, Yutu rover is supposed to drive several miles from the landing site over a three-month mission.